(CNN) -- The Rev. Martin Luther King Jr. was leaving a news conference one afternoon when a tall man with a coppery complexion stepped out of the crowd and blocked his path. Malcolm X, the African-American Muslim leader who once called King "Rev. Dr. Chicken-wing," extended his hand and smiled. 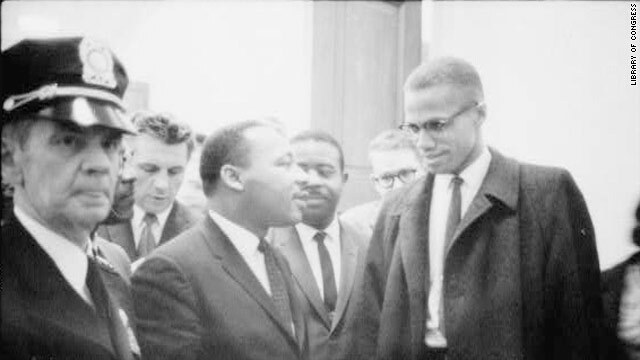 "Well, Malcolm, good to see you," King said after taking Malcolm X's hand. "Good to see you," Malcolm X replied as both men broke into huge grins while a gaggle of photographers snapped pictures of their only meeting. That encounter on March 26, 1964, lasted only a minute. But a photo of that meeting has tantalized scholars and supporters of both men for more than 45 years. As the 85th birthday of Malcolm X is marked on Wednesday, history has freeze-framed him as the angry black separatist who saw whites as blue-eyed devils. Yet near the end of his life, Malcolm X was becoming more like King -- and King was becoming more like him. "In the last years of their lives, they were starting to move toward one another," says David Howard-Pitney, who recounted the Capitol Hill meeting in his book "Martin Luther King, Jr., Malcolm X, and the Civil Rights Struggle of the 1950s and 1960s." In the last years of their lives, they were starting to move toward one another. "While Malcolm is moderating from his earlier position, King is becoming more militant," Pitney says. Malcolm X was reaching out to King even before he broke away from the Nation of Islam and embraced Sunni Islam after a pilgrimage to Mecca, says Andrew Young, a member of King's inner circle at the Southern Christian Leadership Conference, the civil rights group King headed. "Even before his trip to Mecca, Malcolm used to come by the SCLC's office," Young says. "Unfortunately, Dr. King was never there when he came." Though the men met only once, they had been portrayed as foes in the minds of the American public for years. Malcolm X burst onto the national scene in 1959 when he and the Nation of Islam were featured in a documentary, "The Hate That Hate Produced." He became the Nation of Islam's most visible spokesman from his base in New York. While King preached about his dream, Malcolm X said blacks were trapped in a nightmare. "It was his critique of America from the bottom up that was so shocking," says Young. "He was a young man with a Ph.D mind, but he was put out of school. He educated himself in jail by reading the dictionary." Malcolm X's harsh rhetoric helped "decolonize" black people's minds by teaching them to be proud of their African heritage, says James Cone, author of "Martin & Malcolm & America." "King was a political revolutionary. Malcolm was a cultural revolutionary," Cone says. "Malcolm changed how black people thought about themselves. Before Malcolm came along, we were all Negroes. After Malcolm, he helped us become black." Despite their differences, both King and Malcolm X's political activism flowed from the same source, says Pitney, the civil rights scholar. "They were fundamentally spiritual men," Pitney says. "While we remember them for their social and political activism, they were religious and spiritual at their core." Malcolm X, though, wanted to be more than a cultural revolutionary. He broke with the Nation of Islam in March 1964 and announced plans to start a black political organization. He reached out to King and other civil rights leaders. In 1965, Malcolm X traveled to Selma, Alabama, where King was leading a campaign, to offer support. "Brother Malcolm was definitely making an outreach to some civil rights leaders," says A. Peter Bailey, an original member of the group Malcolm X founded, The Organization of Afro-American Unity, and a friend of Malcolm X. "He believed that the one who would be most responsive would be Dr. King." The Muslim leader had developed an appreciation for King, Bailey says. "He had come to believe that King believed in what he was doing," Bailey says. "He believed in nonviolence; it just wasn't a show. He developed respect for him. I heard him say you have to give respect to men who put their lives on the line." Malcolm X may have been willing to join the civil rights cause. But he never subscribed to nonviolence or abandoned his Muslim faith, Bailey says. "The whole idea that he had become a token integrationist at the end of his life -- that's a bunch of jive," Bailey says. King's movement toward Malcolm began as he shifted the civil rights movement to the North, friends and scholars say. During the last three years of his life, King became more radical. He talked about eliminating poverty and providing a guaranteed annual income for all U.S. citizens. He came out against the Vietnam War, and said American society would have to be restructured. He also veered into Malcolm X's rhetorical territory when he started preaching black self-pride, says Pitney. "King is photographed a number of times in 1967 and '68 wearing a 'Black is Beautiful' button,' " Pitney says. A year before King died, the journalist David Halberstam even told him he "sounded like a nonviolent Malcolm X," Pitney says. In the epic PBS civil rights series, Coretta Scott King, the civil rights leader's widow, said King never took Malcolm X's biting criticisms of his nonviolence stance personally. "I know Martin had the greatest respect for Malcolm ...," she said. "I think that if Malcolm had lived, at some point the two would have come closer together and would have been a very strong force." Young, King's close aide, says King had become more militant near the end of his life. "It was more radical to deal with poverty than to deal with segregation so, in that sense, it's true," Young says. "But Dr. King never wavered in his commitment to nonviolence. In fact, he was getting stronger in his commitment to nonviolence. It was a more militant nonviolence." Malcolm X and King never had the chance, though, to explore an alliance. Malcolm X was assassinated in Harlem in 1965. King was murdered three years later. Both were 39 at the time of their death. Both had been abandoned by former supporters. And both left virtually no money to their wives and young children because they refused to profit from their activism. The photo of their meeting endures. It was taken because both men happened to be in the Capitol building that day to listen to politicians debate the 1964 Civil Rights Act, which would later pass. Author Cone says the picture endures because both men embody the " 'yin and yang' deep in the soul of black America." Even as King was changing America, he also realized that Malcolm X was changing him. "Martin Luther King once said that when he listened to Malcolm speak, even he got angry."